Our tour itineraries for Hyderabad effectively plan your trip down memory lane into the glorious history of the Nizams and the affluent heritage of this ancient city. Hyderabad, the 'City of Nawabs', has earned wide acclaim across the world for its ever-hospitable culture, magnificent historic monuments, colorful bangles and shimmering white pearls. 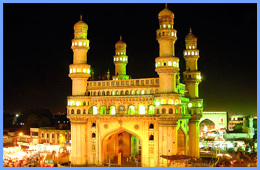 Plan your tour itineraries to Hyderabad with India Profile and get ready for an unforgettable experience. One of the major attractions that you must not miss in your Hyderabad tour itinerary is a visit to the majestic Charminar. The oldest monument in the city, it still stands proud in the very heart of Hyderabad and is always a part of every tourist's tour itinerary to the city, thanks to its very popular glass bangles. You simply cannot resist yourself from buying a bunch of these bangles available in all colors and sizes. Tour itineraries for Hyderabad also encompass a host of other major landmarks in the city - Mecca Masjid, Golconda Fort beautifully illuminated at night, Falakuma Palace that houses the largest ever collection of diamonds, the picturesque Hussain Sagar Lake famous for boating, Birla Temple, Salar Jung Museum, Nehru Zoological Park et al. We at India Profile perfectly customize your tour itineraries for Hyderabad to aptly suit your budget and convenience. You can get your tours tailor made and ensure that every intriguing site in Hyderabad is ideally covered in your tour itinerary. As for the stay during your tour duration, you can leave that worry to us too. We would arrange for the most comfortable stay in some of the finest hotels in Hyderabad to ensure utmost comfort to our guests. India Profile offers online information and booking for Tour Itineraries to Hyderabad and other cities in South India.